With Droid Transfer, you can copy contacts from your Android phone to your PC or laptop. You can then transfer these contacts to a new Android or iPhone! Visit our TouchCopy page if you need to back up contacts from an iPhone instead. Hit the "Contacts" tab from the feature list. Select where on your computer to save the contacts to. Following the steps above is a great quick way to back up your contacts from your Android phone to PC. Droid Transfer saves your contacts in vCard format, which is the most popular format used by Windows Contacts, Outlook and most other applications. As you can see, if you don't select any individual contacts, Droid Transfer will copy the entire list to your PC. If you only want to transfer certain contacts, you can select them by ctrl-clicking them. If you want to transfer your contacts to a new phone, you will instead want to make use of the "Copy to Contacts" option in Droid Transfer. For this, open iTunes and connect your iPhone. Now, in your device menu on the left of iTunes, click the "Info" header. 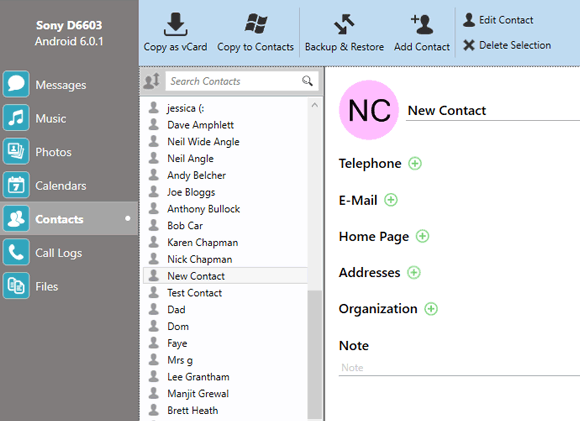 You guessed it - tick "Sync Contacts with", and choose "Windows Contacts" in the dropdown box. This will direct iTunes to the contacts that you backed up on your computer. To start the transfer, click "Apply"! Adding Contacts to your Android phone is easy with Droid Transfer. Simply click the "Add Contact" button in Droid Transfer. You'll then get the option to create a new contact by clicking "New Contact", or to add existing contacts from your PC to your Android phone with "vCard File". New Contact - creating a new contact in Droid Transfer allows you to input Name, Telephone Numbers, Email Addresses, Websites, Organizations, Notes, and a contact photo. Saving this contact will create the new contact on your Android device. vCard File - Using this button, you can add any vCard files from your computer to your Android device. Simply locate your vCard contact files on your computer, and Droid Transfer will add them to your device! Need an easy way to backup and restore Android contacts? You can do this in a couple of clicks with Droid Transfer. Go ahead and click "Backup & Restore". Backup - Choose "Backup" to create a file containing the contacts on your Android device. You can choose to backup all contacts, or select which ones you want to back up. 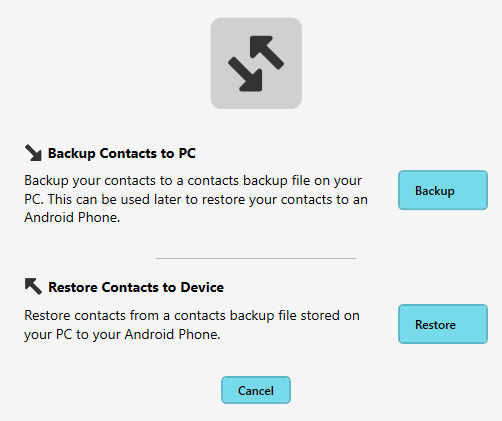 Restore- Using the backup file created above, you can restore your contacts to your Android device, or to a new Android device. This is incredibly useful for transferring contacts from an old phone to a new one, or if something should happen to your phone which causes it to lose all of its contacts. If you need to make changes or update your existing contacts, choose a contact, then click the "Edit Contact" button. Droid Transfer allows you to add, edit and remove existing information on your contacts. Don't forget to save any changes you make to apply them to your contacts on your device! It may be that you want to transfer all your contacts from Android to PC as seen in the steps above and then delete them from your phone to save space. Or you may just want to delete certain contacts that you don't need anymore. How to delete contacts from Android: Simply select a contact, or multiple contacts (by ctrl-clicking them), then click "Delete Selection". Droid Transfer will ask for confirmation before deletion of contacts from your Android.